Years before I started training I would watch muscular guys like Steve Reeves in the movies and wonder how they got to looking the way they did, and how’d they made their way into movies. It was said that if you moved to Europe you could find your way into Italian 'Sword and Sandal' films, as they always used bodybuilders. 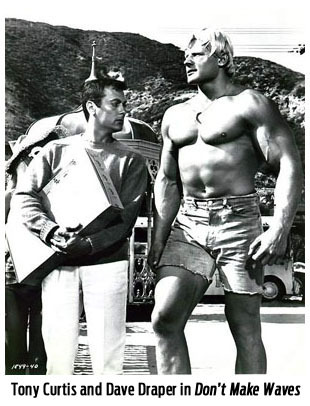 Many good bodybuilders of the '50's and '60's did films in Europe in those days, such as Reeves, Reg Park, Gordon Scott and, a few years later, David Prowse, who played Darth Vader. In 1964 Muscle Beach Party came out and brought a lot of attention to the bodybuilding scene in California. It featured Peter Lupus, who later became a regular on Mission Impossible. Other bodybuilders in that film were Larry Scott, Steve Merjanian, Chet Yorton, Dan Haggerty (later to play 'Grizzly Adams' on TV), Gene Chuey, and a few muscle girls as well. and sandal film each week. That host was none other than bodybuilding legend Dave Draper. He was an awesome sight, and there was no one else like him on TV. That gig would bring Dave a lot of future film roles. In 1967 Dave had made a movie called Don’t Make Waves, with Tony Curtis. There was an array of bodybuilders in that film, like Chet Yorton and Reg Lewis, to name a couple. 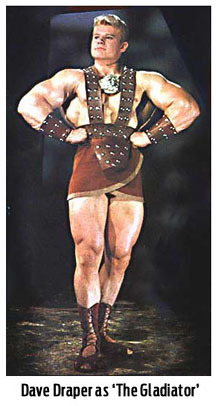 The film really began to put bodybuilding on the map in a public way. I must have watched it a dozen times, and would be inspired to train each time I watched it. I had to have traps, delts and arms like Dave. I never would have guessed that years later that he and I would be training together, but that's the magic of bodybuilding. Back in the late-50's to early-60's there was a group of guys who trained on the beach in Santa Monica and lived in an apartment building right on the boardwalk that was called ‘Muscle House’. It was owned by a woman who also cooked their meals for them. One of the bodybuilders was an actor who came from New York to live the Hollywood dream, but he wasn't having much success at the time. As he was preparing to go on another audition he told the guys in the house that if he didn't get this one he was packing his bags and heading back to New York. He'd had enough of fruitless auditioning and was just about finished. Well, he apparently was prepared for the rejection at the audition and so projected a somewhat cocky, dismissive attitude. Much to his surprise, it was just what they were looking for! He wound up landing the gig, as the lead in a series that would last six years. That man was Vince Edwards and the show was Ben Casey. So, you never know where things may lead to when you get involved with bodybuilding. While Clint Eastwood wasn't a competitor, training was in his blood and he was always around the gym crowd, and we all know how he's done since his 'Spaghetti Westerns' of the '60's. Robert Duranton, who was a French bodybuilder who later went into Pro Wrestling, landed a film with Shirley Maclaine, but in the film never even showed his body. He wore a suit and tie, and he had a pretty decent role with her. William Smith was an arm wrestler and bodybuilder who trained with Vince Gironda and was featured on the cover of one of Joe Weider's magazines in the 50's. His first big TV gig was as a cowboy in the series Laredo. He went on to do over 100 films and TV shows and played the character Falconetti on the 1970's series Rich Man Poor Man. Bill was also the badass in that memorable fight scene with Clint Eastwood on Every Which Way but Loose.